Poll: Who should replace Oran Kearney as Coleraine manager? Declan Devine, Steve Lomas and Kenny Shiels are all names being touted as potential successors to Oran Kearney at Coleraine. It's an upheaval no Coleraine supporter wanted, but one every fan is bound to understand. Oran Kearney has made his move across the Irish Sea, having been unveiled as St Mirren's new manager on a three year deal. He goes having earned respect and admiration across the Irish League, both for his managerial ability and also for his qualities as a man. Passionate, motivational, funny and always respectful, he was a joy to work with for his staff at the club (as goalkeeper Chris Johns explained yesterday) and also for us members of the press. He's taken charge of a Coleraine team that are the current Irish Cup winners and are well capable of adding the Gibson Cup to the CVs. Now they need a new man to lead them to the title. Who will it be? 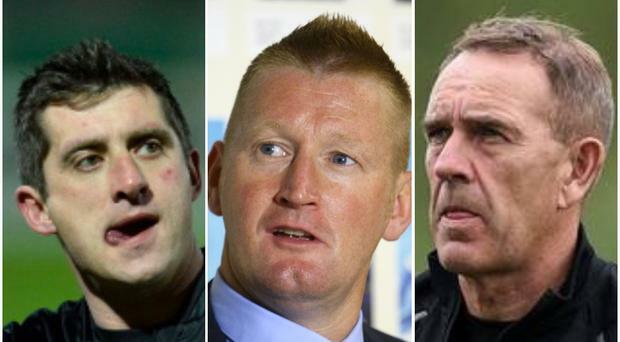 Early names linked with the job have been Steve Lomas, who took charge of Millwall back in 2013, former Derry City manager Declan Devine and current DC chief Kenny Shiels. Could Paul Owens even take the step up? Like Lomas, he used to play for the club and went on to spend three-and-a-half years as Limavay United boss before joining Coleraine as a coach last summer. Another former Bannsider Gary Haveron is without a club, as is Tommy Breslin, although he's understood not to favour a return to management, while Darren Murphy is a first-team coach at Linfield but has experience of managing with Dungannon Swifts. By Steve Jones Coleraine recorded their first win in six games as Jamie McGonigle's hat-trick inspired the Bannsiders to all three points against Crusaders.